We are offering discounts until Dec 1 for stays longer than 4 days. 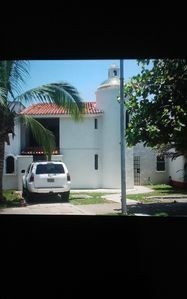 Contact us for exclusive rates! 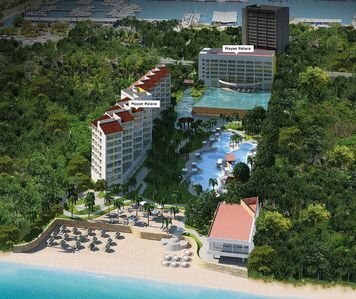 Book with us so you can come relax at this new, luxurious, privately-owned property at Isla 33 Resort & Villas. Located on the ground level, the pool is just steps away. 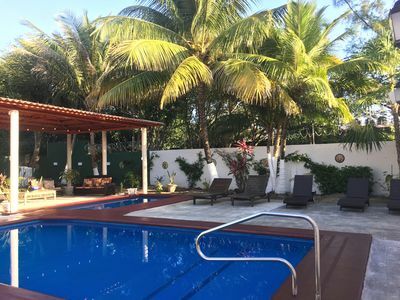 It is the perfect location for relaxing by the pool or relaxing on the private patio while enjoying the warmth of the sun and the Caribbean breeze. This new Villa is the only one at Isla 33, with an outdoor bar area, equipped with a bar area and barstools adjacent to the kitchen window. It also has comfortable outdoor furniture, and a gas grill! It’s the perfect place to host a party, or have a family BBQ! The back balcony overlooks a local park, where kids play, and families gather. The people are truly the gem of this beautiful island. 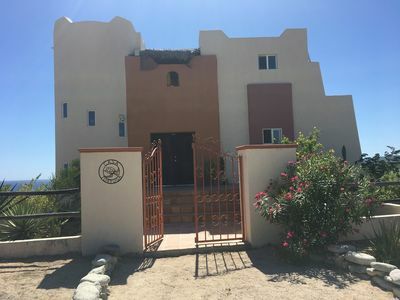 The property sleeps up to 6 guests in two large bedrooms. The guest room with `two full size beds and one master suite with a king bed. Is the perfect place to enjoy with friends, family or for a romantic getaway. Enjoy stunning water views from the outdoor patio, the living room, the master bedroom, and the kitchen. The Villa features a spacious, open concept plan. 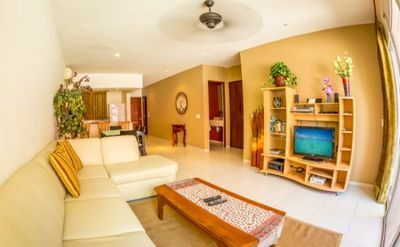 As you enter the large living area, you will be greeted with a spectacular view of the Caribbean Sea. Decorated with a Caribbean flair, the azule sectional sofa may be the most comfortable on the island! The big screen TV, is the perfect place to watch a movie while listening to the waves crash along the shore. With wall-spanning pocket doors, the view is completely unobstructed which allows the warm breeze to permeate the condo. A breakfast bar is nestled between dining room and kitchen Enjoy the kitchen granite countertops, stainless steel appliances, microwave, coffee maker, and purified water. 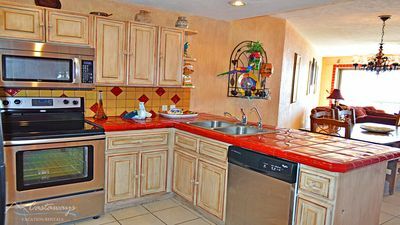 The kitchen is fully equipped so you can make breakfast, a beach picnic lunch, or even create a gourmet meal. The window in the kitchen opens up to the balcony bar. This allows for easy passing of drinks, snacks or food for the bbq. Those in the kitchen can easily socialize with those on the balcony. This luxury condo is truly a home away from home. The master suite has a large king size bed, flat screen tv, Jacuzzi tub, shower, double sink vanity, closet and safe. 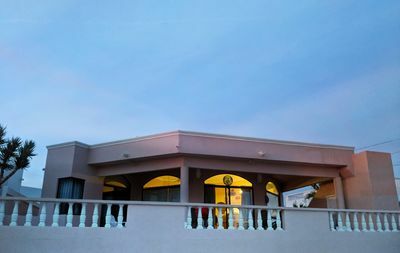 From the room and adjoining terrace, you will experience the joy of the sunrise over the sea . 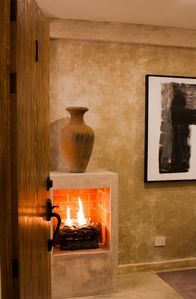 The room also features hand-made domed brick ceilings – a traditional architectural detail in the Yucatan region. The guest bedroom is just off the dining room -a large room with two full beds, dresser, and closet. The sliding glass doors open to the back balcony where you can bbq, party, or relax while enjoying the sounds of the neighborhood. The second bath is just outside the bedroom and features a large walk-in shower and stone sink. Isla 33 is a complex like no other on the island. 3 swimming pools, free wifi, digital tv, a gym, rooftop yoga, and off street, covered parking. 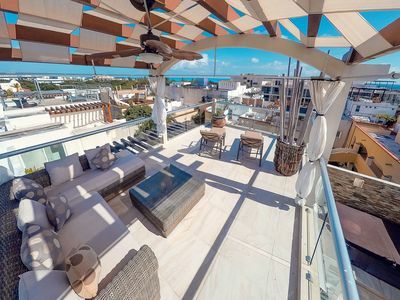 From the rooftop pool and patio, enjoy breathtaking views of the sunrise and sunset, in addition to the panoramic views of the island. . Less than 10 minutes from the great restaurants and fun of Hidalgo Street and North Beach, it is centrally located on the island. 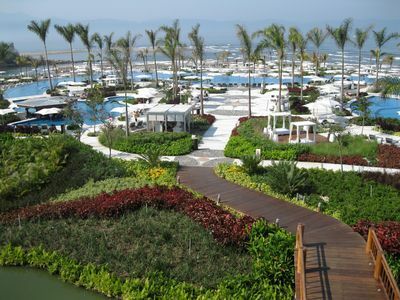 Here you will enjoy tranquility, beautiful sea breezes and unparalleled ocean views. 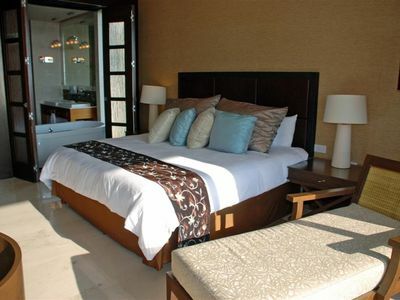 With one king bed and two full size beds, the villa sleeps up to 5 people. It is a perfect place to enjoy with friends, family or for a romantic getaway. Enjoy stunning water views from the outdoor patio, the living room, the master bedroom, and the kitchen. 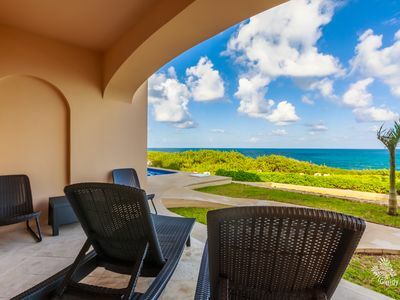 As you enter the large living area, you will be greeted with a spectacular view of the Caribbean Sea. 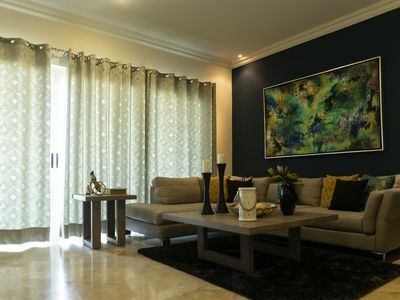 Decorated with a Caribbean flair, the azule sectional sofa may be the most comfortable on the island. While listening to the waves crash along the shore, the big screen TV is the perfect place to watch a movie or a game. With wall-spanning pocket doors, the unobstructed view allows the fragrant breeze to permeate the rooms. With an open, spacious concept plan, the living room flows into the dining room which features a large table comfortable for six. A breakfast bar is nestled between the dining room and kitchen. Enjoy the kitchen’s granite countertops, stainless steel appliances, microwave, coffee maker, and purified water, right from the tap. 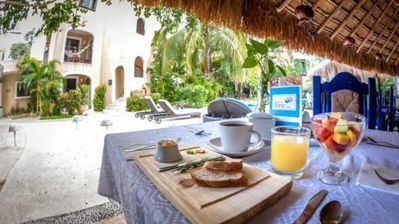 You can make breakfast, a beach picnic lunch, or even create a gourmet meal in the fully equipped kitchen The kitchen window opens up to the balcony bar. This allows for easy passing of drinks, snacks or food for the bbq. Those in the kitchen can easily socialize with those on the balcony. This luxury villa is truly a home away from home. The master suite has a large king size bed, flat screen tv, Jacuzzi tub, shower, double sink vanity, closet and safe. 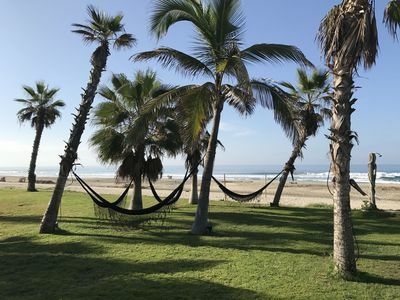 From the room and adjoining patio, you will experience the joy of waking up to the sunrise over the sea . The room also features hand-made domed brick ceilings – a traditional architectural detail in the Yucatan region. The guest bedroom is just off the dining room. It is a large room with two full beds, flat screen tv, dresser, and closet. The sliding glass doors open to the back balcony where you can BBQ, party, or relax while enjoying the sounds of the neighborhood. The second bath is just outside the bedroom and features a large walk-in shower and stone sink. 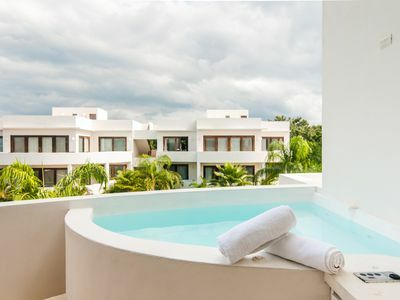 With 3 swimming pools, free wifi, digital tv, a gym, rooftop yoga, and off street, covered parking, Isla 33 is a complex like no other on the island. 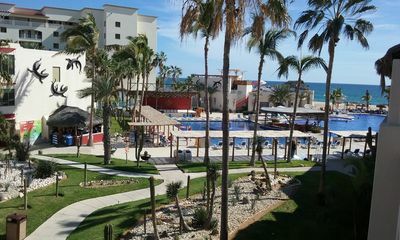 From the rooftop pool and patio, enjoy breathtaking views of the sunrise and sunset, and panoramic views of the island. 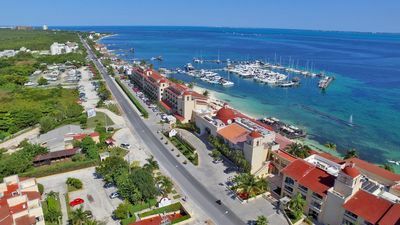 Located less than 10 minutes from the great restaurants and fun of Hidalgo Street and North Beach, it is centrally located on the island. 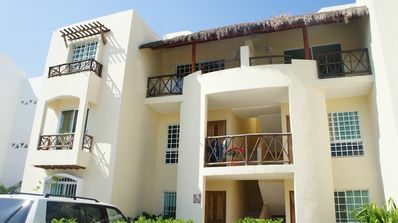 Here you will enjoy tranquility, beautiful sea breezes, and unparalleled ocean views. Our condo also boasts a concierge, Vicki, will greet you at the condo and walk you through the condo so you feel comfortable. She can also set you up with, golf cart rentals, snorkel tours, a private chef, or anything else you can think of. She has lived here full time for years, and also will be happy to recommend, any type of our local restaurants. 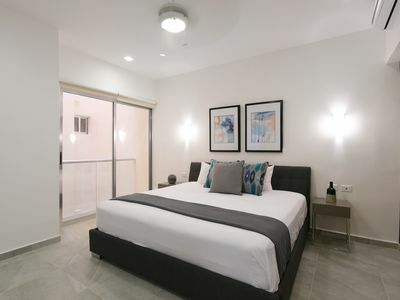 ONE BEDROOM SUITE, Marina Vallarta , Puerto Vallarta, MX.